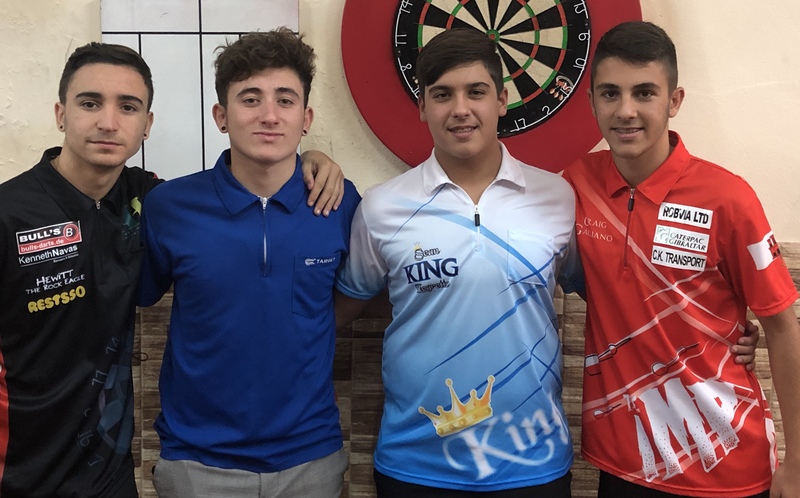 The first Youth Ranking event of the 2018/19 season took place on Wednesday 21st November, and all players were fighting to claim the first title of the season. It has not yet been officially announced where the 2019 Youth European Cup will be taking place but the race for qualification started off with this event. As expected the four seeded players came through their respective match with relative ease. Craig Galliano defeated Dylan Duo Jnr 4-0, Jerome Chipol defeated Liam Santos 4-0, Sean Negrette defeated Nick Garcia 4-0 and Justin Hewitt defeated Nico Bado 4-0. In the first Semi-Final match Craig Galliano defeated fellow teammate Jerome Chipol 4-1. Jerome showed signs of improvement but Craig’s scoring was too much to handle. In the second Semi-Final game Sean Negrette defeated fellow teammate and doubles partner Justin Hewitt 4-1. The game was a brilliant watch with both players scoring heavily throughout. Unfortunately for Justin he missed several darts at doubles and Sean was quick to punish each time Justin missed. Leg 1 – Sean wins the first leg in 14 darts on Double 16 to lead 1-0. Leg 2 – Craig levels the game on double 2, 1-1. Leg 3 – Craig hits Double 20 to take the lead, 2-1. Leg 4 – Sean hits Double 16 to level the game up, 2-2. Leg 5 – Sean misses Double 16 for a 152 finish, eventually wins the leg on Double 2 to extend his lead, 3-2. Leg 6 – Craig misses 1 darts at double to level, Sean steps in and hits Double 1 to win 4-2 and clam the title. Jeremy Cruz caught up with Sean Negrette for an interview after the final..
Firstly Sean, congratulations on your victory, you must be happy to get your season off to a great start? Last season you won two out of six ranking titles and finished first in the standings, are you confident you can do even better this season and win more titles? This year will be your final year as a Youth Player and undoubtedly your main target will be to qualify for the 2019 European Youth Cup, are you confident you will make it in the top 4? This season you have joined the Super league which is a senior event. Do you think playing with the adults and playing a bigger format will help improve your game? Finally Sean, last season you finished first in the Youth Rankings, second in the Youth League and sixth in the senior rankings. What are your targets for this season?